Me and fitness go way back to the year I started my period. Like with most---if not all---teenage girls, it was an awkward and confusing time evolving from "girl" to "woman." One of my favorite bodily changes to adjust to? My metabolism. Unforeseen and unwelcome, I quickly bloated and gained until I went from a size 6 to a size 14---all in one year. I wasn't so crazy about this "period" stuff. Least of all because it was gross. My self-esteem hit an all-time low, only exacerbated by being the victim of bullying about my weight at the hands of my very own family. Well, you know what they say about the bottom. There's no way but up. So up, I went. Over the following 6 months, I didn't lose a lot of weight. But I worked out consistently, and slimmed down until I was a "lean and mean" size 6, and so much healthier than when I had been that size before. As a mother, fitness and I started having relationship problems again (that has a tendency to happen, doesn't it?). We weren't communicating anymore, and we weren't seeing each other either. We decided it was best to see other people, at least for the time being. So fitness moved on to see other people---a lot of other people, after all, my local gym is always occupied during operating hours. And me? Well, I became close with a newborn (and inevitably an infant, and toddler) who had all kinds of fun stuff coming out of all of his orifices. Good times. Months came and went... Who am I kidding? Years. Years came and went... and before I knew it, I had arrived at a point where my son was wanting more time with his dad, and this looked like the perfect opportunity for me and fitness to start seeing each other again (wink wink!). It's always humbling to return back to the gym only to discover that you don't just pick up where you left off... but instead feel like you're starting at the beginning all over again. Thank goodness for muscle memory, at least. With persistence, I got back to where I had left off, and in much less time than when I first started working out regularly. Now, as a mother of two, I find the most important thing to staying fit as a parent is consistency. And it takes products I can rely on to perform optimally to make me comfortable and help me stay fit. That's why, when it's that time of the month, I use U by Kotex Fitness. For my solo workouts using the treadmill and weight machines, and for my favorite zumba classes, the reliable performance of the U by Kotex Fitness tampons and pantyliners keep me going---always. 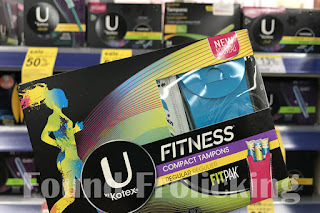 You can get a U by Kotex Fitness products at an even better price for a limited time with this coupon on Ibotta. So get the coupon, and then head into your nearest Walgreens to find your fitness and pick up the U by Kotex Fitness feminine hygiene products that work for you. For more information, head over to Daily Break. Check out our video about U by Kotex Fitness! Disclosure: This is a sponsored post. I received product to facilitate the writing of this content, and financial compensation when the links embedded within this post are clicked. All opinions expressed are my own, and were in no way influenced by the brand or any other sources. The post and all photos with the watermark are the property of Found Frolicking, and should not be used or distributed in any way without first receiving permission. Found Frolicking is in no way responsible for prize shipment, but will work with the sponsors in all ways possible to ensure the winner receives their prizes. I wear the U by Kotex pads (tampons aren't for me) and they are the only brand I trust not to leak on me!! If you are looking for top body fitness then result then you must require some extra drugs and pills which will help you to get the best fitness result, and form this online summitgym.net/ you may easily find the best fitness supplements and pills for you with the best quality. I need to pick these up when I jog! Plus I love that there is a coupon. Kotex is my favorite sanitary pad brand. I like that they're stepping up to the game on the tampon department. 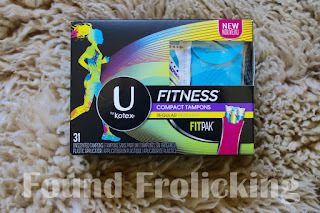 My teen daughter would like the U Kotex Fitness brand for when she is physically active. Kotex is a really good brand and I love that it doesn't cause any leakage. I love how discreet U products are! They are perfect for workouts! Kotex is my family's favorite brand because it really offers the protection we need during those days. I will let my daughter and my niece know about U Kotex Fitness. They may want to use this for when they head out to the gym. I love the Kotex brand. It works great to keep me protected and lets me do what I need to do without worry. Tampons aren't really for me (they just do not feel right). I do use U by Kotex though. It is the only brand I will use. I haven't had to used any type of feminine products in a few years. Before I had my hysterectomy I used U by Kotex and loved them. I could work or do my normal routine without worry of leaking or being uncomfortable. There are chances that you might get stretch marks. The stretched skin becomes loose as you got fit. May you experience these marks during exercise or these may got appear after your fitness plan. But no need to worry there are many alternatives available to get rid off stretch marks.